New for 2018, we are updating our support offerings for all our clients. We aim to provide a consistent, easy to use support service across all sites, with a range of packages to suit your needs. We have developed a 3 tier support system and believe that each package will meet the different requirements of our clients. These range from a free basic level with minimal handholding, through to a monthly retainer with full support. What are the Support Packages? This is the free, entry-level pack for all sites except Bespoke sites. This is most recommended for our basic, level one Teal sites. This includes a block £100/ 1.5 hours of support time, which can be used as needed. 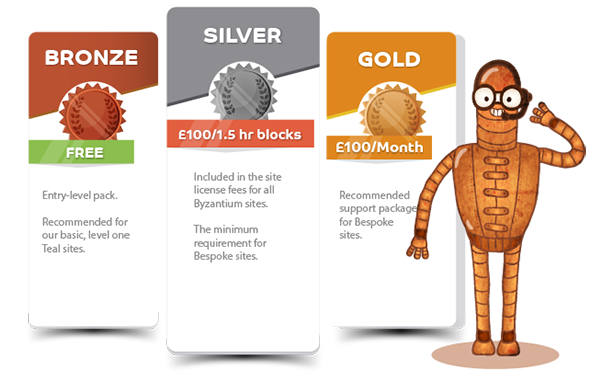 This package is included in the site license fees for all Byzantium sites and is the minimum requirement for Bespoke. Additional blocks can be purchased as needed. Regular monthly invoice of a minimum of £100 per month for 1.5 hours time which is reviewed monthly. This is our recommended support package for Bespoke sites. How will the Support Packages be Rolled Out? All support packages will start when you launch a new site or at renewal of your existing site. When we speak to you about a new or renewed site, we will recommend the support package for your needs. In addition, we will also make some ideas for improving or upgrading your site, for example increasing site speed or look and feel. If you would like to take advantage of a paid for support plan now, these are available for £100 for 1.5 hours (Silver) or £100 per month (Gold). Please contact us if interested. What Kind of Site Do I Have?